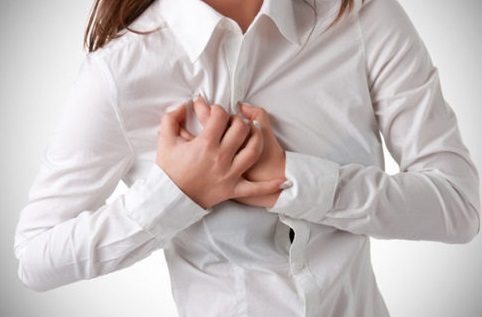 One of the many unpleasant cold symptoms, chest congestion can make breathing a Herculean task. It is a common companion of major cold and flu symptoms like a runny nose, coughing and sneezing. The natural remedies listed here can help you to safely get rid of chest congestion fast and easily at home. If you’re suffering from the flu and have a mild cough, avoid chilled beverages and iced drinks until you’re back in good shape. Also, avoid oily foods as they promote mucus production in the chest lining. Repeat the remedy until the congestion clears. Onion is one of the oldest natural remedies used to get rid of chest congestion. Sulfur and quercetin present in onions are responsible for the stinging and the waterworks that get going when you get near a fresh-cut onion. They can also be of immense help to facilitate decongestion when you’re struggling to breathe. Peel an onion and cut it into 4 parts. Heat the cut onion in the microwave for 2 minutes. Remove the hot onion pieces from the microwave and put them into a small towel. Bundle up the towel to make a poultice. Test the temperature of the poultice so that it’s bearable. Place the onion poultice on the bare skin of your chest or back. Keep it there for 30 minutes at a time. For best results, cover the poultice with a warm compress. Do this daily until the chest congestion is gone. The best way to break up congestion is to steam it out with essential oils. Steam carries the essential oil vapors through the nasal cavity to the area gripped with congestion. The antimicrobial and anti-inflammatory properties of essential oils make them effective against the infection that’s causing the congestion. Eucalyptus and peppermint essential oils are the most appropriate choices when it comes to decongestion, as both are effective in clearing out the nasal passages. Eucalyptus oil is considered an excellent expectorant. Not only does peppermint oil soothe and calm the body, it also has analgesic properties. Pour 2 cups of water into a pan and bring it to a boil. Pour the steaming hot water into a bowl. Put 5 to 10 drops each of eucalyptus and peppermint essential oils into the bowl of steaming water. Cover your head with a towel, making a sort of tent to trap the steam. Bend over the bowl to breathe in the vapors of the essential oils. As your nasal passages start opening, breathe in as slow and deep as you can. Repeat 2 or 3 times daily until the congestion goes away. Vicks Vapor Rub is a common household name and is considered a cure-all for a majority of cold-related ailments. Some of the active ingredients in the popular brand formula are eucalyptus oil, turpentine oil, and camphor, all of which are considered very effective decongestants. When applied to the chest, you can breathe in its vapors. This helps the active ingredients reach into the body easily and work to relieve congestion. Take some Vicks Vapor Rub on your fingers and rub it over your chest and throat. Cover the area with a towel or a thick cloth. Repeat the remedy until you find relief from congestion. Note: The normal Vicks formulation is not suitable for children under age 2. If you’re wary of the popular vapor rub brands and don’t trust the ingredients that they might be using, a DIY vapor rub is just what you need. It’s simple to make, easy to use and can be applied to people of all ages without fear of any side effects. It contains choice essential oils in a skin-friendly base of coconut oil and shea butter. Eucalyptus and peppermint oils, known for their benefits against colds, congestion, and mild fevers, are the main constituents. Lavender and lemon oils lend more than calming effects to the rub and work as an antihistamine and an immune-booster, respectively. This recipe also contains tea tree oil for added benefits. All you need to do is gather the ingredients, whip them up, store the resulting vapor rub and use as needed until your chest congestion is treated completely. This gentle formulation can be safely used on children. Note: Do not apply this DIY vapor rub directly over or under the nose. For infants or small babies, rub a small amount on the bottoms of their feet only and put their socks on. If the DIY homemade decongestant proves too strong for you, reduce the amount of cayenne pepper and ginger powder to half. When stored in a cool and dark environment, the DIY decongestant can keep for a long time. Shea butter can be substituted with cocoa butter in the DIY vapor rub recipe or skip it all together if need be. A simple coconut oil base can be used in a pinch. Add beeswax to the DIY vapor rub to give it a firmer texture. Some other essential oils that can be used to make a DIY vapor rub to get rid of chest congestion include thyme, basil, rosemary, pine, clove, marjoram, and chamomile.